The 11-bout lineup for World Series of Fighting’s sophomore show has nearly been finalized. The March 23 event takes place inside Revel Resorts & Casino in Atlantic City, New Jersey. 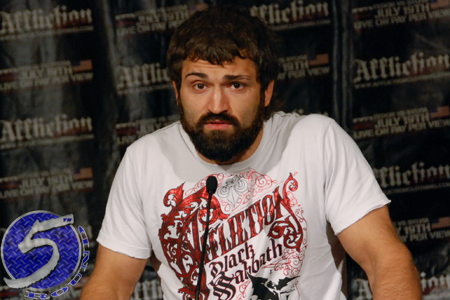 A heavyweight shootout between former UFC stars Andrei Arlovski (pictured) and Anthony Johnson headlines the festivities. Marlon Moraes and Tyson Nam battle to become the promotion’s inaugural bantamweight champion in the card’s co-featured attraction. So far, nine former UFC fighters are participating in the event. NBC Sports Network broadcasts the five featured fights live beginning at 9:30PM ET/6:30PM PT. No word on if the prelims will be made available for viewing. WSOF is still looking to add a sixth and final preliminary bout to the roster.